BACKGROUND AND PURPOSE: Touch and brush sensory stimuli elicit activity in discriminative touch pathways involving specific regions in the spinal cord and brain stem. However, no study has mapped normal sensory activity noninvasively in healthy humans. The purpose of this study is to map the neuronal activity of sensory input to understand abnormal sensory transmission. MATERIALS AND METHODS: In the present study, spinal fMRI (by using SEEP) was used to map the activity involved with light touch (2 g and 15 g von Frey filaments) and brush stimuli in the brain stem and spinal cords of 8 healthy volunteers. The results were spatially normalized and analyzed with custom-made software. Areas of SEEP activity were identified by using general linear model analysis. RESULTS: The 2 g von Frey filament showed predominant activity in the medulla around the ipsilateral dorsal gracile and cuneate nuclei. The 15 g filament elicited significant activity in the ipsilateral dorsal and contralateral ventral gray matter areas of the spinal cord, areas around the olivary nuclei, pontine reticular formation, periaqueductal gray, and raphe nuclei in the rostral pons and midbrain. The brush stimuli elicited more activity in the medulla around the ipsilateral cuneate and gracile nuclei. CONCLUSIONS: The 2 g filament and brush stimuli activated areas associated with a touch response. The 15 g filament activated areas associated with a pain response. 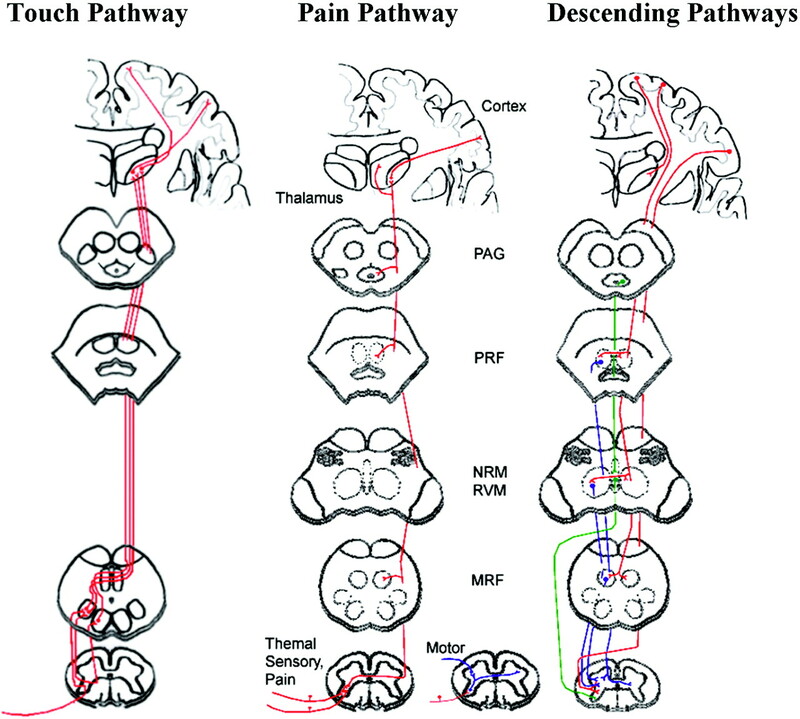 The results from this study identify specific neuronal regions in the brain stem and spinal cord involved in sensory transmission and help understand altered sensory and pain states. Human beings depend on sensory cues from the environment for their existence. The inability to properly detect these sensations due to injury or disease can have dramatic effects on an individual's health and quality of life. Inappropriate pain sensations caused by an innocuous sensation such as putting on clothing (allodynia) as well as sensory loss due to multiple sclerosis or diabetes1 are severe debilitating conditions. Much of what we know about sensory transmission has come from neurophysiologic studies in healthy and injured humans. However, fMRI has proved to be a very powerful tool for neuroscience research and has been used to study how sensory information is transmitted and processed in the cortex, in both healthy individuals and in clinical populations.2–4 However, there remains a gap in our understanding of how sensory information is relayed and processed from the spinal cord to the brain stem, both of which are essential for the normal perception of sensory information. To obtain a consistent and complete understanding of how this information is transmitted from the periphery to the cortex, and how injury or disease can alter this transmission, it is necessary to study the entire central nervous system from the first synapse in the spinal cord to the processing centers in the brain stem. The purpose of this study was to use an established spinal fMRI method17–19 to map areas of neuronal activity in the brain stem and cervical spinal cord that are involved with touch and brush sensations in healthy volunteers. We hypothesize that the full distribution of sensory activity from touch and brush stimuli can be reliably mapped in intact human volunteers by means of spinal fMRI. Eight healthy, right-handed subjects (1 male) participated in this study with a median age of 21.5 years (range, 18–26 years). Respondents answered a questionnaire to exclude any current or previous neurologic disorders, brain or spinal cord injury, peripheral injury affecting the sensitivity of their hands to touch, as well as subjects with MR imaging safety risks (eg, implants, pacemaker). The research protocol was reviewed and approved by the Queen's University Human Research Ethics Board, and all subjects provided informed consent before participating. All data were treated confidentially with each set of data images assigned a unique identifying number that was only accessible by the experimenter. fMRI studies of the spinal cord were carried out in a 3T Magnetom Trio (Siemens, Erlangen, Germany) by using a phased array spine receiver coil. Initial localizer images were acquired (with subjects lying supine) in 3 planes as a reference for section positioning for subsequent fMRI studies. Functional image data were acquired for each study with a half-Fourier single-shot fast spin-echo sequence with an echo time of 38 msec and a repetition time of 1 second per section. Fourteen contiguous sagittal image sections, each 2 mm thick (voxel size 1 × 1 × 2 mm), were selected to span from the C7/T1 disk to the superior edge of the thalamus with a 200 × 100 mm FOV and a 192 × 96 matrix. Spatial suppression pulses were employed to eliminate signal intensity anterior to the spine and motion artifacts from the heart, and flow-compensation gradients were applied in the rostral-caudal direction to reduce artifacts from flowing CSF. The peripheral pulse was recorded throughout each study for use in the subsequent data analysis. Tactile stimulation was applied manually by using 2 or 15 g von Frey filaments or 2-cm-wide artist brushes (soft or hard). Von Frey filaments were calibrated to produce a force of either 2 g or 15 g when applied perpendicular to the skin such that a semicircle formed in the nylon fiber. The artist brushes were of different stiffness so that the harder brush had stiffer bristles while the softer brush felt very light on the skin. The 2 types of touch stimuli were chosen to represent a static (von Frey) or dynamic (brush) response because these 2 types of stimuli are known to activate different pathways.20 Touch stimuli were repetitively applied and brush stimuli were moved back and forth over the dorsal surface of the right hand near the thumb. Applying the stimuli to the dorsal surface of the thumb activates afferents that innervate the C5/C6 level of the cord. These afferents then activate touch or pain pathways based on the intensity and duration of the applied stimulus. The stimuli were applied at a frequency of 1 Hz so that it was possible to apply them manually while providing a nearly continuous stimulus related to the speed of the fMRI signal intensity change response. The stimuli were applied by an experimenter who was in the scanner room throughout the duration of the experiment. The results from the 2 brush stimuli used in the study were very similar and thus interpreted together, as there were no significant differences observed in the areas or extent of activity. Stimuli were applied in a block paradigm consisting of 3 stimulation periods of 56 seconds duration, interleaved with baseline periods of 140 seconds in which no stimuli were applied, and an initial baseline of 84 seconds for a total of 11 minutes 12 seconds for each experiment. All of the volunteers received the 4 stimuli, and the order of the experiments was randomized across the volunteers to avoid order effects across repeated experiments that may arise from changes in the subject's anxiety, interest, and other variables over time. A final scan was performed for anatomical localization. After each experiment, volunteers were asked to rate the pain intensity of each stimulus on an 11-point numerical analog scale where 0 indicates no pain at all and 10 indicates the worst possible pain imaginable. Additionally, subjects were asked to rate the sensation in the context of unpleasantness where 0 indicates not unpleasant and 10 indicates excruciatingly uncomfortable and intolerable.21 Pain is not necessarily an “on/off” phenomenon but is a continuum with varying degrees from “none” to “worst imaginable”, and thus this evaluation was needed to assess, though subjectively, the perceived intensity and unpleasantness of pain by the volunteers. A volume analysis based on volume measure of activation within a given region was conducted.28 The number of activated voxels during the experimental task for the 2 g and 15 g filament was determined for the 8 volunteers and localized to a given set of regions: thalamus, midbrain, pons, medulla, C5, C6, C7, and C8. An average voxel count across all 8 volunteers and all defined regions was calculated. Statistical analysis, to observe any significance between the 2 g and 15 g stimuli in the identified regions, was determined by a 2-tailed, paired, Student t test (P < .05) with results displayed as mean ± SD. Average voxel counts across the 8 predetermined regions with the 2 g and 15 g stimuli are shown in Fig 1 A. The average number of activated voxels was significantly higher for the 15 g stimulus (188.4 ± 85.1) as compared with the 2 g stimulus (103.4 ± 56.8) in the thalamus. The total number of active voxels for the 15 g stimulus (435.5 ± 130.1) was also significantly higher than the 2 g stimulus (304.5 ± 106.9) (data not shown). Although all other areas in the brain stem and cervical spinal cord showed slightly higher numbers of activated voxels with the 15 g stimulus, there was no significance found. However, at spinal cord levels C5 and C6, the number of voxels with the 15 g stimulus were less than the 2 g stimulus, but this was also not found to be significant. A, Average numbers of voxels for the 2 g and 15 g stimuli across 8 healthy volunteers. Regions of interest include areas in the brain stem and cervical spinal cord. The only significance was found in the thalamus where there were more active voxels with the 15 g than 2 g stimulus. B, A box and whiskers plot of mean pain intensity and unpleasantness scores with SD across 8 healthy volunteers. Also included in the plot are the range of values for intensity and unpleasantness. The diamond corresponds to the median for the range of data and is indicated as a numeric value to the right of bars. The pain intensity and unpleasantness ratings for the 15 g filament were significantly higher than for the 2 g filament. Significance (*) was determined by using a 2-tailed, paired, Student t test (P < .05). 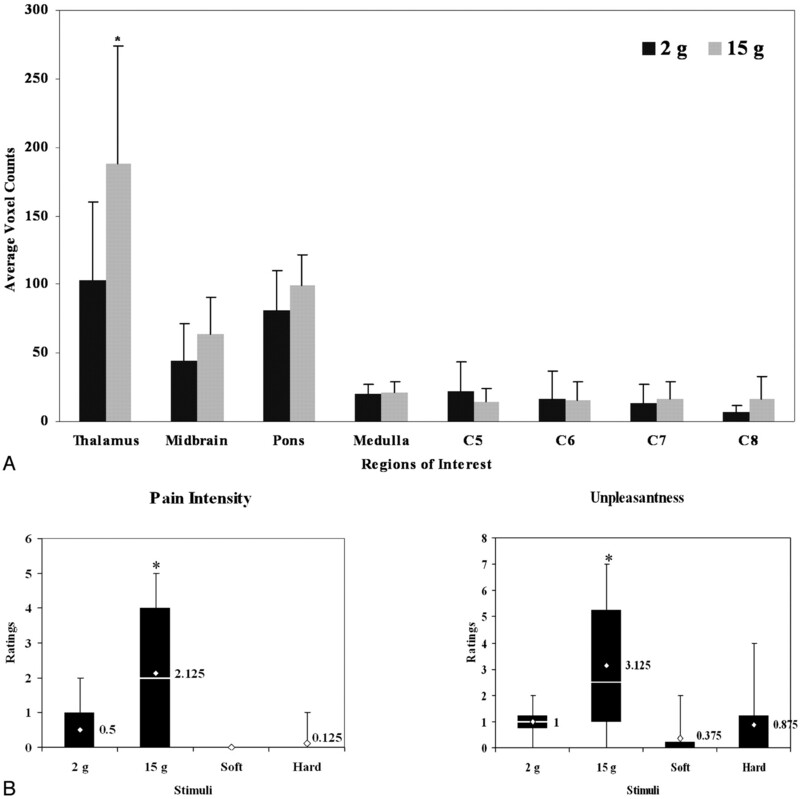 Pain intensity ratings ranged from 0 to 2 for the 2 g von Frey filament and from 0 to 5 for the 15 g von Frey filament; unpleasantness ratings ranged from 0 to 2 and 0 to 7, respectively. Mean pain intensity ratings for the 15 g von Frey filament were significantly higher than with the 2 g filament (Fig 1B), whereas mean unpleasantness ratings were not statistically different. Pain intensity and unpleasantness ratings ranged from 0 to 2 for brush-induced mechanical stimuli. There was no significant difference in mean pain intensity or unpleasantness between the 2 brush stimuli. Group results showed significance in consistent areas of activity (T > 2.5) (Fig 2). Group results displayed in this manner have some benefits. This is the first time that spinal cord and brain stem data have been spatially normalized so that voxel-by-voxel group analyses are possible. Grouped results showing significant activity in 1 location, in close vicinity to a known area involved with this type of sensory transmission, is too coincidental to not conclude that we are indeed detecting the activity in that relevant area of the anatomy. Additionally, the grouped data are unmasked, showing all of the activity that falls within a stringent statistical threshold, and thus all of the activity displayed is significant. Combined data showing location of neuronal activity in touch (2 g and 15 g filament) and brush stimuli from 8 healthy volunteers superimposed onto transverse anatomic drawings. The figure shows significant areas of activity (T > 2.5) across the group. The T-value correlation map on the right indicates the corresponding color for each T-value. The asterisks indicate specific areas referred to in the text. The 2 g filament showed localized activity in the ipsilateral dGM at C7 and C8. There is also activity in areas around the gracile and cuneate nuclei in the medulla. The 15 g filament elicited activity in the ipsilateral dGM and contralateral vGM areas, as well as in the ipsilateral cuneate and gracile nuclei. The 15 g filament also elicited neuronal activity in the region of the olivary nucleus, reticular formation, raphe nuclei in the rostral pons, and PAG. In the midbrain, there was activity in the thalamus (data not shown), contralateral red nuclei, and areas of the substantia niagra. The brush stimuli (Fig 2) evoked activity in the spinal cord but more so in the medulla and pons. There was activity in the ipsilateral dGM and vGM at C8 and some contralateral dGM at C7. Activity was detected in areas around the ipsilateral cuneate and gracile nuclei in the medulla; however, activity was not noted in the area near the olivary nucleus (as with the punctate mechanical stimuli), but was seen in the reticular formation of the pons. There was also activity detected in the ipsilateral red nuclei for both brushes. An analysis of positive and negative signal intensity changes for both filaments showed negative signal intensity changes for the 2 g stimulus and positive signal intensity changes for the 15 g stimulus at the C6 level of the cord (Fig 3). There were more positive signal intensity changes in the brain stem with the 2 g stimulus (Fig 2) and more negative signal intensity changes in the spinal cord as compared with the 15 g stimulus (Fig 3). This is evidence of descending modulation from the brain stem and is discussed in detail below. Positive and negative signal intensity responses with 2 g or 15 g von Frey filaments. Each row shows 8 consecutive transverse sections spanning the C6 level of the cord. Respective T-values (−7.0 < T < 7.0) are represented with colors as indicated at the bottom of the figure. This study demonstrated activity in areas of the spinal cord and brain stem elicited by innocuous touch (static) and brush (dynamic) mechanical stimuli in all of the volunteers who were studied. There are few fMRI studies29,30 that have systematically examined innocuous mechanical stimulus–induced activity along the cervical spinal cord and brain stem. This study is unique in that it focuses on determining the functional activity induced by sensory stimulation within the spinal cord and lower supraspinal structures in human subjects who can simultaneously rate their sensory experiences. Although an integral part of everyday life, the neuronal activity involved with these sensations has never before been studied in the brain stem and spinal cord of healthy humans. These results can potentially be used in a clinical setting as an important reference to understand how perceived sensations may be altered by injury or disease. It has been suggested that static and dynamic allodynia is transmitted via different sensory neurons within the peripheral nervous system. Static allodynia is signaled by nociceptive A fibers and mediated by central sensitization,20 but it may also involve C-fiber (nociceptive) neurons. Dynamic allodynia is generally thought to be independent of C-fiber activation and mediated by Aβ fiber activation, because selected blockage of Aβ fibers by compression-ischemia abolishes dynamic but not static allodynia.31 The differences in anatomic regions observed between touch (static) and brush (dynamic) stimulation correspond with the well-established differences in sensory transmission pathways for such stimuli. The 2 g von Frey filament and brush stimuli demonstrated patterns of activity in the spinal cord and brain stem that are consistent with the dorsal column–medial leminscus pathway (Fig 4). Contralateral dGM activity was detected in the C6 level of the cord for both stimuli, but more activity was detected with the 2 g filament. Activity in the contralateral dGM could be evidence of descending projection efferents of the bulbospinal tract originating in supraspinal structures and terminating in the spinal cord.32 These descending efferents have been known to modulate incoming sensory responses and release serotonin to produce anesthesia at the spinal cord level33 contralateral to the stimulus.34 In the brain stem, both 2 g von Frey filament and brush stimuli elicited activity in areas of the medulla in the area of the ipsilateral cuneate and gracile nuclei; however, the brush stimuli elicited more activity in this region. The activity observed in the medulla could indicate direct Aβ fiber projections, which typically transmit information from an innocuous mechanical stimulus originating in the peripheral nervous system to the ipsilateral gracile and cuneate nuclei in the medulla.35 These identified regions, combined with the low pain intensity and unpleasantness scores reported by the volunteers (Fig 1B), indicate that the dorsal column–medial leminscus pathway was activated by the 2 g von Frey filament and both brush stimuli. Activity in the spinal cord, PAG, and raphe nuclei with the 15 g filament is expected to indicate descending pain modulation. The PAG receives ascending projections from the spinomesencephalic tract, spinoreticular pathway, and descending projections from the amygdala, cortex, and hypothalamus. The PAG then modulates incoming pain information by activating raphe nuclei in the rostral ventromedial medulla, which in turn causes the release of serotonin in the dorsal spinal cord to inhibit incoming sensory stimuli.39–42 The voxel counts for the 2 stimuli show that the 15 g filament activated significantly more voxels (435.54 ± 130.1) than the 2 g filament (308.46 ± 106.9) and the increase in the number of active voxels for the 15 g filament originated in the thalamus (103.42 ± 56.8 for the 2 g filament and 188.42 ± 85 for the 15 g filament), evidence again of descending modulation. Across all volunteers, negative signal intensity changes were observed in some regions of the spinal cord with the 2 g filament, but not with the 15 g filament (Fig 3). 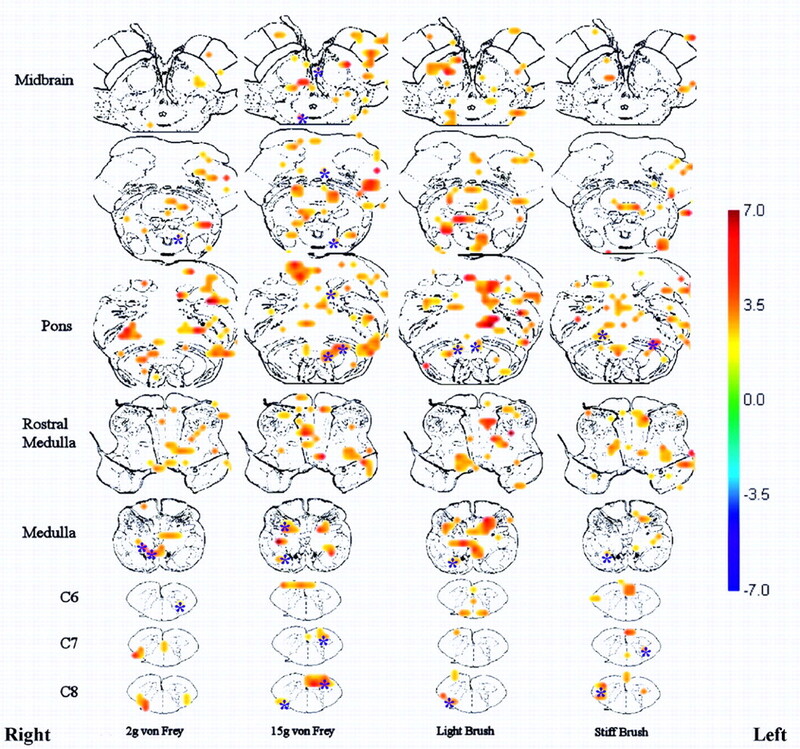 One theory by Logothetis et al suggests that BOLD fMRI reflects neuronal input to a given area rather than its spiking output.43 Although that study examined the effects of neuronal input with BOLD signal intensity changes, previous studies comparing SEEP and BOLD signal intensity changes in the brain have demonstrated related signal intensity changes and areas of activity,15 indicating that we may be able to apply the same interpretation to SEEP signal intensity changes. Using this logic, if changes in signal intensity are related to changes in presynaptic input,43–45 then a negative signal intensity change reflects a reduction in input, for example, to dorsal horn neurons because of reduced activity in another remote area.46 This negative signal intensity change is indicative of decreased descending inhibition (or excitation) from brain stem structures that would result in decreased activity (from baseline) in the dorsal horn neuron resulting in a negative signal intensity for the 2 g filament and not for the 15 g filament. This is physiologically relevant because the 2 g stimulus requires less descending modulation (because it is less painful), as compared with the 15 g stimulus, leaving the dorsal horn neurons more sensitive to stimulus input. In contrast, a 15 g stimulus is slightly noxious, and descending input modulation is necessary to modulate the incoming pain information, resulting in positive signal intensity changes. Taken together, these results show that the 2 g filament requires less modulation, because it is a less painful stimulus than the 15 g filament. This is relevant because it suggests that the descending modulatory system is responsible for why some stimuli are interpreted as noxious when they are in fact innocuous. This is extremely pertinent in neuropathic pain, where nonpainful stimuli are perceived as painful or where spontaneous evoked activity evokes pain sporadically. These states can be explained by changes in the descending modulatory system. Although many studies to date have employed fMRI to study activity induced by tactile stimuli, primarily in the cortex, none has yet employed spinal fMRI as a tool to study sensory transmission in the spinal cord and brain stem. This is the first study to demonstrate how sensory information is transmitted from the first synapse in the dorsal spinal horn to the brain stem in healthy volunteers, thus providing a complete representation of the transmission pathways. A few studies have extended as far as the PAG,11,47 but none have examined the activity simultaneously in the brain stem and as far caudal as the cervical spinal cord. The findings from this study have identified activity in all of the expected spinal cord areas and brain structures related to sensation and pain, such as the dGM areas of the spinal cord, gracile and cuneate nuclei in the medulla, and PAG.48–52 This study also showed changes in descending modulation, which is very important for the study of pain. The neuronal activity in the identified brain stem and spinal cord regions corresponds with the known neuroanatomy and reflects the reliability and sensitivity of fMRI. Identification of these spinal cord areas and brain stem structures (associated with touch and brush sensation) lays the foundation for future studies that aim to understand abnormal sensory responses due to injury or disease. The authors thank Sharon David for technical assistance, as well as members of the Stroman Laboratory (Chase R. Figley, Celina C. Nahanni, Natalie Kozyrev, and Randi Beazer) for reviewing the manuscript. This research was supported by the International Spinal Research Trust (U.K.), the Canada Research Chairs Program (P.W.S., C.M.C. ), and by a Premier's Research Excellence Award (C.M.C.). Accepted after revision September 10, 2009.